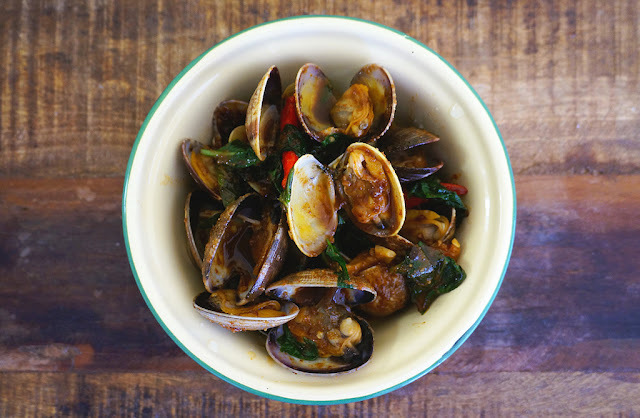 Stir-fry clams with roasted chili paste is one of my family’s favorite dishes. To make this dish, you will need to get a good Thai chili paste or you can make it at home too. The recipe is on my previous post. The chili paste taste really good with clams. Simply delightful! In a large wok, heat the oil over high heat. Cook the garlic and chilies until fragrant and golden in color. Then add roasted chili paste and toss in the clams. Give it a quick stir and mix in the half of the Basil, fish sauce, and sugar. Give it another quick stir cover and cook until all the clams are open. Toss in the other half of Thai basil, mix well. Serve immediately. yum! the roasted chili paste sounds like a great thing to keep around! What kind of chilies do you use for the chili paste? Hi Ninette, the dried chili I used is red in color and slightly smaller than cayenne pepper. You can find the chili at most Asian grocers. I guiltily confess to having used store-bought jars of roasted chili paste for years! I'm very excited to see a recipe for how to make it myself! Thanks for sharing your recipe--from scratch always tastes best!